The Fresno 40, one of the city’s most fought-over pieces of real estate near Woodward Park, will soon begin a transformation that has been more than two decades in the making. The developer and owner, Zinkin Family Development, expects to break ground in 90 days on a retail, office and multi-family development called Park Crossing. The first anchor tenant will be Sportsman’s Warehouse, the Utah-based sporting goods outlet. A slew of national chain restaurants and retailers including a pet supplier, clothing and shoe stores, an upscale grocery store and a high-end liquor and wine tenant could follow. The project has been about market timing, said developer DeWayne Zinkin Sr. The vacant Fresno 40 property — which actually measures 38.93 acres — bordered by Friant Road, Audubon Drive, Cole Avenue and Fresno Street in northeast Fresno has a storied history. It was first slated for single-family homes. Then in 1990 the property was zoned for office use and became the proposed site for Valley Children’s Hospital. The hospital, now known as Children’s Hospital Central California, later decided to move to Madera County. When Zinkin presented plans to turn the property into a mixed-use development, Woodward Park Homeowners sued twice over traffic and air pollution concerns. An appellate court sided with the homeowners on their first challenge. Zinkin tweaked the plan, and in 2009, a judge ruled in favor of the city’s approval for the project. Two years later, with a favorable appellate court ruling in hand, Zinkin declared a victory and announced plans to move forward. 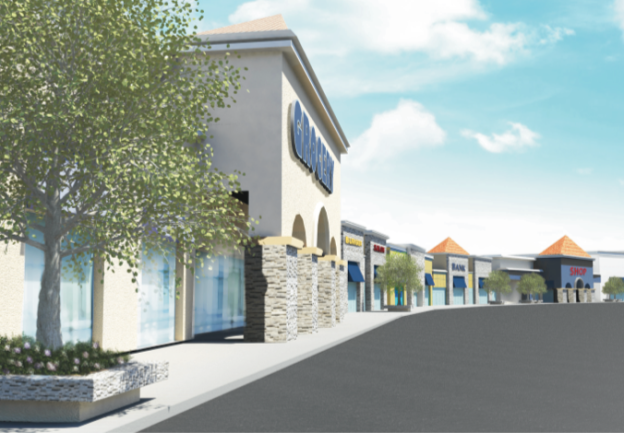 The 200,000 square feet of retail space, which will have about five anchor tenants, will be built first along Friant Road and Fresno Street. Another 250,000 square feet of office space is planned for a section near Friant and Audubon while the multi-family portion, which will have fewer than 50 units, will be built on the backside along Cole. The first tenants are expected to open by mid to late 2015. Fresno city spokesman Mark Standriff confirmed that the developer has submitted grading and utility plans but has not yet pulled building permits. The city is waiting for a revised site plan, he said. Fresno City Council Member Lee Brand, whose district includes Park Crossing, recalls hearing development plans years ago when he served on the city’s planning commission. When nothing happened with the land it became an extended part of Woodward Park with people walking by it or with dogs, Brand said.